When we construct a porch, we simply extend your existing roof line and use the same roofing material to achieve a seamless transition. You can have a front, back, or even a wraparound porch to increase the square footage of your home, increasing your property’s real estate value. Patio Creations also specializes in screened porches for those who would love to lounge outdoors without worrying about insects. 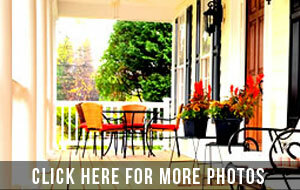 Find out more about porch addition and screened porches by calling us today!